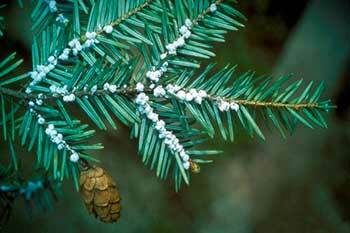 The hemlock woolly adelgid (HWA) is a tiny, aphid–like insect that damages hemlock trees by inserting its mouthparts into the base of the needles and removing plant fluids. 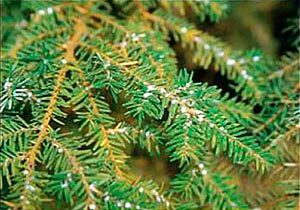 The Michigan Department of Agriculture & Rural Development (MDARD) is reminding homeowners and landscapers that although hemlock woolly adelgid (HWA) can be seen year round, spring is one of the better times to inspect hemlocks for their presence. HWA was first discovered in Virginia in 1951 and has since infested hemlock trees from Maine to Georgia. HWA has decimated hemlock stands across much of the eastern U.S. Approximately 100 million hemlock trees are present in Michigan forests and hemlocks are commonly utilized in landscape plantings. At this time, HWA is not known to exist in Michigan although it has been found here before. HWA has been documented in the Harbor Springs/Petoskey area (2006, 2007, and 2010), the Utica and Clinton Township areas of Macomb County (2010), the Grand Haven and Holland areas (2010) and the New Buffalo area of Berrien County (2012). At each of these sites, MDARD required the removal and destruction of infested trees, treated hemlocks in close proximity to those infested trees with insecticides and is conducting follow-up surveys. The biggest threat of introduction of HWA into Michigan comes from the importation of hemlocks, primarily through the nursery and landscape trade, from areas where HWA is established. If you have ever had hemlock planted on your property, your hemlocks could have an increased risk of having HWA. 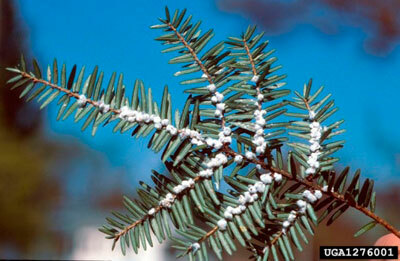 Michigan’s Hemlock Woolly Adelgid Quarantine restricts the movement of hemlock into the state, and includes a complete ban on the movement of hemlock from infested areas of the country into Michigan. Examine your hemlocks for the presence of white cottony masses on the underside of the outermost branch tips where the needles attach. As it matures, HWA produces a covering of cottony-like wax filaments to protect itself and its eggs from natural enemies and to prevent them from drying out. The “cotton” can be readily observed from late fall to early summer.